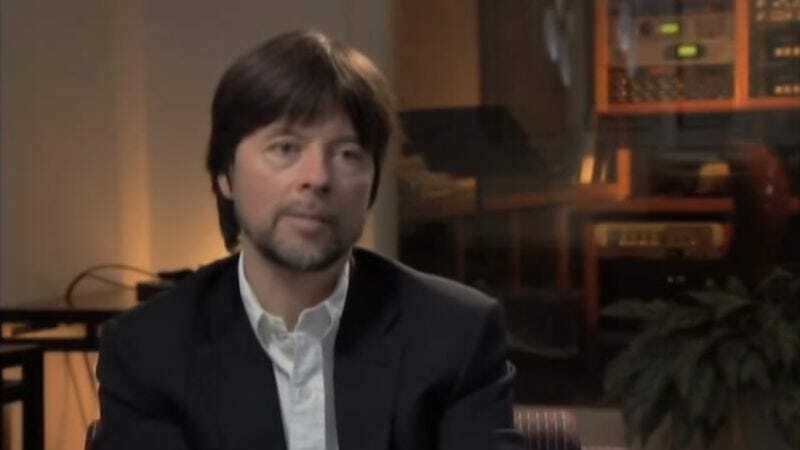 For Spinal Tap’s Nigel Tufnel, jazz is merely “a series of mistakes without the ‘oops.’” For prolific PBS documentarian Ken Burns, however, jazz is a vital and truly American art form worthy of serious study and contemplation. Burns conceived his earnest, well-meaning 2001 series Jazz as the culmination of a trilogy that began with The Civil War in 1990 and continued with Baseball in 1994. He talked about these topics and more in an interview with the Archive Of American Television back in 2010, and in so doing, he happened to repeat the word “jazz” many, many times. Musician Bill Baird used this linguistic anomaly as the basis for a bizarre and disorienting YouTube video entitled “Ken Burns Says ‘Jazz’ 3 Billion Times (Actually 2.97 bn) In Under 3.5 Minutes.” Quite simply, Baird has isolated the moments from Burns’ archival interview in which he says the word “jazz” and strings them together and layers them on top of one another until they create an impenetrable wall of pure, Burnsian nonsense. Baird is not particularly philosophical about what all of this is supposed to mean. “I am a weirdo,” he writes. “I get a kick out of these things.” The video starts out in a fairly lighthearted manner, with the screen dividing and sub-dividing and sub-sub-dividing to allow room for more tiny Ken Burnses, all saying the word “jazz.” It’s kind of cute, really. But then, there’s a blackout about halfway through, and suddenly the viewer is bombarded with an ominous infection of Ken Burns doppelgängers too small to even recognize. Even the word “jazz,” when stacked on top of itself millions of times this way, becomes incomprehensible. The effect is ominous, a nightmare combination of The Matrix and the “Sorcerer’s Apprentice” scene from Fantasia, only with documentary nerds instead of brooms. In summary: jazz!